The Capital city Itanagar witnessing a massive protest rally with over hungreds of congress workers holding a protest march against the Citizenship ( Amendment) Bill 2016. The protesters also release black balloon to mark the protest on the occasion from various location. Arunachal Pradesh Congress Committee( APCC ) and several other take out a protest march against CAB on the same time when Prime Minister Narendra Modi visited the city for laying foundation stone of Greefield Airport and inauguration of several other development project worth 4000 crore. The APCC led a massive protest march from Rajiv Bhawan to Tennis court complex at IG Park but the rally was stopped in mid way by the security forces near Tallang Hira Memorial. 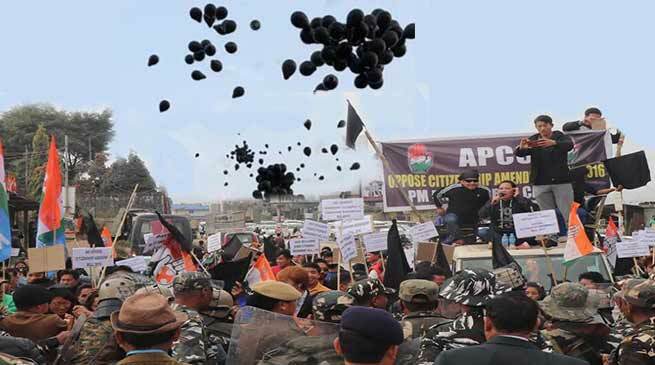 Hundreds of protesters raising black flag, holding play cards, banners and shouting slogans against CAB-2016 and demanded scraping the bill which is against the interest of the indigenous people of state and region. The protesters were stopped on its way near Tallang Hira Memorial on National Highway-415 inspire of warnings by the Executive Magistrate the protesters tried to move forward and in scuffle five congress leaders received minor injuries. The APYC President Geli Ete while inform that around four thousand black balloon filled with gas was released from various location of the state capital which include DDK Colony, Niti Vihar, Mowb-II, RWD Colony and near APCC Office. Meanwhile a Joint coordination committee of various seven organisation also carried out protest march from Akashdeep to Tennis court but they too were stopped by the police forces at the same venue near Tallang Hira Memorial. The said Joint coordination committee of Mass organisation having banners, posters and shouting slogans demanding for immediate rollback of CAB-2016 which was passed by Lok Sabha, rollback on the statement of PRC issue, immediate suspension of Capital Deputy Commissioner and Director of land Management for allotment of public land of IG Park for BJP Office construction. Students of Rajiv Gandhi University (RGU) also carried out protest march in the campus against citizenship Amendment Bill-2016. Shouted slogans holding banners, placard. Terming CAB as dracaena law against the ingenious people of the state and region demanded for immediate scrap otherwise they will continue to protest. The students leaders said. Several student union also take part in the protest including students from Himalayan University (HUSU), North East Regional Institute of Science & Technology (SUN) and others.